Distilled in the year 2000 and entirely matured in an American virgin oak cask. 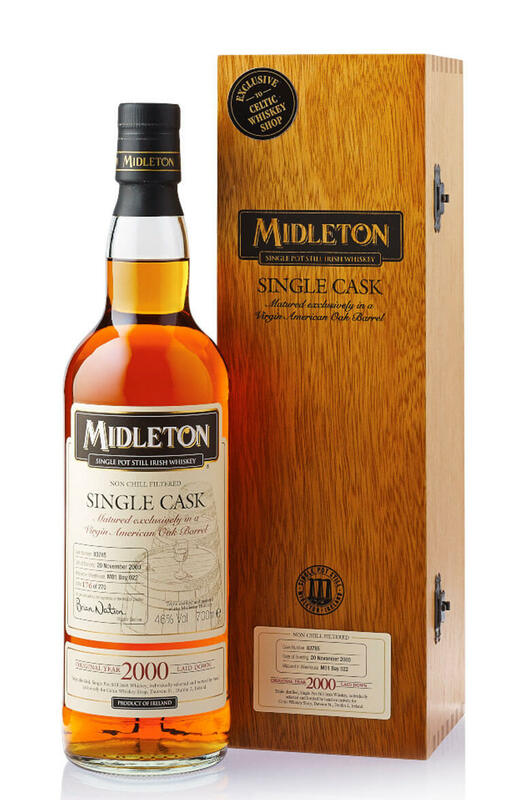 This is one of our favourite Midleton single cask whiskeys, and it is packed with rich pot still character and some delicious sweet and spicy notes from the virgin oak. Only 270 bottles were made. Nose Like walking into a sweet shop. Aromas of candy floss, boiled sweets, and pear drops then some cinnamon, mace and vanilla. Palate Mouth filling, complex and full flavoured but very smooth. Sweet and fruity with touches of orange peel, cloves, cinnamon buns, tropical fruits, vanilla oak and fruit cake. Nicely structured with soft tannins. Types of Barrel used for Aging A single American virgin oak cask. Any Additional Information of Note Non-chilfiltered. Only 270 bottles released. Exclusively available from the Celtic Whiskey Shop. Exclusively available from the Celtic Whiskey Shop This superb bottling of single pot still Midle..